Above: Searching for epic adventure on Figueroa Mountain above the Santa Ynez Valley. Photo by Chris Kostman, March 2008. Published in Endurance News, V.61, January, 2009. "Epic" is defined at www.dictionary.com as "heroic; majestic; impressively great" and "of unusually great size or extent." To live on the endurance path is to live in search of epic experiences. Distance: The longer the adventure, the more "out there" it will likely become. But words like "far" and "ultra" are relative to one's experience and training level. How far is far? Farther than you’ve been before, perhaps. Weather, especially Unexpected Weather: Rain, wind, snow, hail, sandstorms, heat, and many other things we often call "weather" can turn "an ordinary outing" into an epic outing. Likewise for related phenomena like floods, road washouts, and the like. Of course, sometimes we go deliberately in search of intense weather, like cycling in the dead of winter, or running across a desert in summer, or when tempting fate during monsoon season with only a t-shirt on our back. Mechanicals / Breakdowns: Cycling is about the body-bike interface. When the bike breaks down, so can the whole system and pretty soon we're no longer a cyclist, but a bike-pusher or hiker instead. But more often that not, mechanicals don't completely disable the bike, they just make it a whole lot harder to ride. Similar fates can befall running gear, swim goggles, XC skis, and other equipment “necessary” for the endurance athlete. Can you turn adversity into an opportunity? Going Somewhere New, especially Unplanned: "Hey, I wonder where that road - or trail - goes?" can be The Seven Magic Words just before an ordinary workout turns epic! Getting Lost: See point immediately above, a closely related subject. Running out of Food and/or Water: There's nothing like the bonk, or a good thirst, to make things interesting. Getting Sick or Injured: Such a list must, of course, being with throwing up and related GI distress from either end, along with blisters, blown out joints, thrown out backs, and the myriad possibilities which can result from crashes, falls, and other accidents. Can you push through? Encountering the Unusual: Crossing paths with deer, giant turkeys, bobcats, snakes, or millions of grasshoppers, to name just a few examples of the animal variety, can make things memorable. Unusual varieties of people, places, and more are also out there, too. Don’t ride or run right past them! Racing the Sunset: Running out of light, when you don't have your own lights, can be simultaneously exhilarating and frightening. No matter how tired you become, at the end (or near the end) of an epic ride, run, or ski, the adrenaline usually kicks in when the sun is nearing set and there are still miles to be covered. Road / Trail Surface: If smooth, beautiful pavement were the only good place to ride, we should just all ride velodromes! Mix it up. Ditto for running and every other kind of human movement over the landscape: Are you an outdoor athlete, or just recreating your usual indoor treadmill workout, elliptical jaunt, or lap swim? Using the "Wrong Bike" for the Ride: This is a topic, and concept, which is near and dear to me and which inspires my blog slogan "Any Bike, Anywhere." I love to pedal, and I love to pedal anywhere I possibly can (or can't). Mountain bikes: who needs them? Unlikely Routes: Linking roads and regions together with trails and other connectors that most people wouldn't think of is an exciting and enlightening flight of fancy. The end result is a one-of-a-kind route, a tour of disparate regions, and a ride or run that is perhaps half dirt and half paved. Cycling version nickname: "Rough Riding." Adventure-seekers on the endurance path aspire to be prepared and ready for any circumstance, but when they're not, they get the job done, while reveling in the opportunity to have new experiences, to explore the inner and outer universes, and to learn new things about the world, about their endurance sport of choice, and about themselves. What defines EPIC for you? When was your last epic experience? When will the next one be? How about today? See you out there! Click "Comment" below and share your story! Click here to download the 48 page Pdf of Volume 61 of "Endurance News," featuring this story. 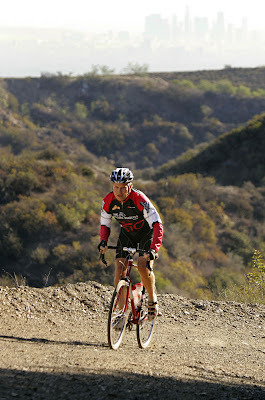 Above: The author on Canyonback Trail above Brentwood (Los Angeles) on his Ritchey Break-Away with 650B wheels and tyres. Photo by Al Seib / LA Times, January 2008. More on that bike in that configuration. 400K while I felt like throwing up before I ever started, could not eat, I finished it on 6 cokes and half an energy drink! THAT was epic!! 200k in 2006... It was 57 and rain to start, the temperature dropped to 32 with Sleet, Ice, Snow, along with a good wind that was on us both directions! Many DNF'd that day... I rode with Lew (one of the Pac Rats) Meyer and Doug CS pup Levy... While Doug was complaining that his Eyelids were frozen, I complained about the trucks splashing slosh all over the back of my legs, Lew Meyer complained about NOTHING! LOL THAT was epic! Believe it or not, BMB does not even fall in the "epic" category! Despite the fact that it was the longest "event" that I finished, and despite the fact that I felt really crappy at Ludlow, and despite the fact that we had heavy wind coming across Lake Champlain on the way back, it did not have that "epic" feel to me.. That suffering beyond all comprehension, yet still pushing on. Finding that little bit left inside for that next pedal stroke that brings us just a little bit closer to the finish line.. THAT is what makes an epic! I certainly don't have the distances (yet) that red tail hawk does, I do frequently head out and see a trail or road and think "I wonder where that goes? ", very often. I've ridden my road bikes on MTB trails, some with some pretty technical parts while my brother and other friends used full-susp. MTBs. In the rocky sections I was slower as I had to pay attention to my line or carry the bike, but I caught back on at almost every incline. Bonking hard, barely getting to a little family-run gas station/village pizza shop was a treat. I could barely pedal as it was, and fell down in the gravel parking lot trying to get unclipped. I bet they got their laughs at the lycra-clad dork who couldn't walk too well. 64 oz. of Gatorade later I could make it home. Yak. But those are the things, like red tail hawk said, that you remember. 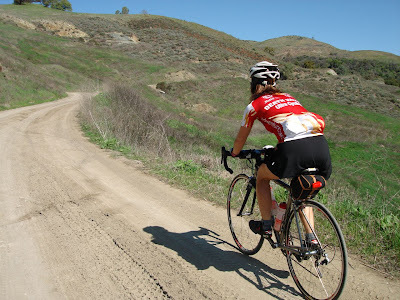 Does anyone do a dirt-road/off-road ride that is more of a club ride than race? I'd like to see more of that. Single-track 200K's? I think it'd be a hoot. just had the skinny tire roadie out playing in the snow. a little doubletrack action for good measure. couple more shots if interested. I'm not sure what epic really means to me. I've experienced many of the described challenges, but I think that's more of what I consider 'life' than epic. I'll call/txt you, and Elizabeth when I realize I've had an epic experience. Maybe it will happen during the GDR this year. Please don't be mad at me if I call you guys at 2am from some random town telling you about my epic experience.